Anyone who’s ever watched a film set in Middle Earth will appreciate just how gorgeous the Kiwi landscape can be – but there are a few features which don’t quite get the same level of attention, largely because none of the action in the Lord of the Rings or The Hobbit takes place atop one of them. We’re talking, of course, about New Zealand’s stunning glaciers – which have gone a long way toward shaping the landscape we know and love. There are more than three thousand glaciers in the country, and all but twenty of them are to be found in the Southern Alps, on the South Island (recall that New Zealand, being in the southern hemisphere, is colder toward the country’s south). With that in mind, let’s look at some of the more famous and worthy of visitation. This glacier is so named because it flows into the Tasman sea. It’s the largest of all the glaciers in the country, and as such among the best places to begin this list. From end-to-end, it measures around twenty-seven kilometres, and covers a space that’s larger than a hundred square kilometres. You’ll find it just beneath the tallest mountain in the country, Mount Cook, and, naturally, Mount Tasman, from where it flows south-eastward toward the Mackenzie Basin. Since this glacier is so vast, it takes a considerable trip to cover the entire thing, even by helicopter, and so sightseers are certain to get their money’s worth. Once you arrive at the very top, you’ll be able to take a short hike across the ice, and take in the nearby peaks. While this glacier might be the largest on offer here, it’s also shrinking at a rate of almost two-hundred metres every year. This effect is so obvious that the lake at the glacier’s very foot is growing. In the 1960s, the area was just a few disparate ponds; but they’ve since merged to form the formidable Lake Tasman, whose waters expand year-upon-year. This glacier was named after a Scottish explorer, who visited this area in the late Victorian era to establish a farm. The glacier itself is a ‘hanging’ glacier, which terminates just at the edge of a sheer drop handing over the top of the valley beneath. During summertime, chunks of the glacier can fall off toward the valley floor, creating a terrifying and deafening spectacle. If you’d like to take in the glacier, the best point from which to do so is the summit of the Rob Roy valley trail beneath. 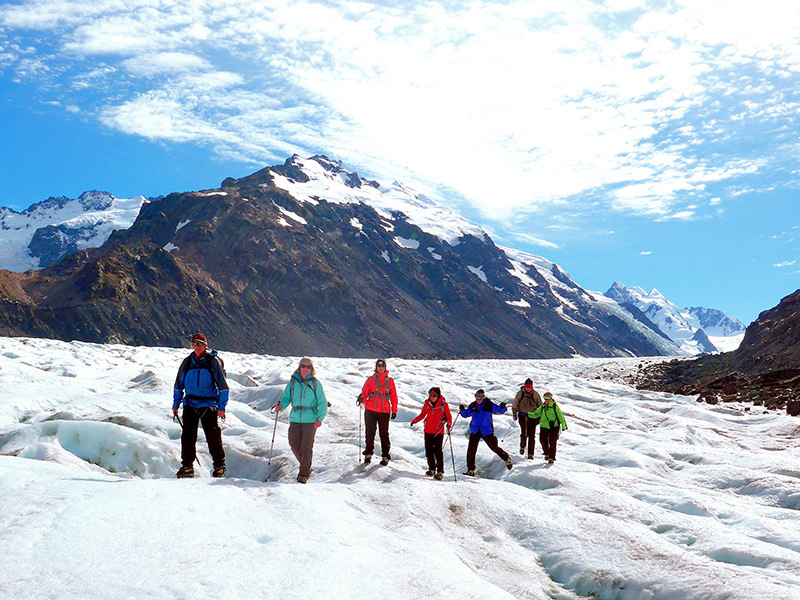 You’ll eventually arrive at an observation point from which you’ll have an unrestricted view of the glacier itself. During the walk, you’ll come through forests, gorges, and across wooden bridges suspended over precipitous drops – making the hike itself almost as spectacular as the glacier at the end of it. These two glaciers are within just a short trip from one another, and so one might easily incorporate a trip along both into the same excursion. The Franz Josef Glacier is around twelve kilometres long, and was the first glacier in the country to be named by western settlers, after the emperor of Austria. The original Maori name for the glacier, however, is ‘Kā Roimata o Hine Hukatere’, which means ‘the tears of Hine Hukatere’. The story of Hine Hukatere is an example of Maori tragic myth; the woman in question was a snow deity whose lover felt the cold considerably more than she did. After he died on the mountain, she cried until her tears formed the glacier in question. Pay a visit to the glacier in real life, and the sights are just as evocative and powerful as the story. Bear in mind, however, that it’s no longer possible to ascend the glacier right from the bottom on foot – you’ll need to instead take a helicopter at least partway up. The Fox Glacier, on the other hand, was named after the Prime Minister of New Zealand between 1869 and 1872. It passes through the Fox valley, carving steep cliffs into the rock on either side before winding through a rainforest on its way to the Tasman sea. It’s every-so-slightly longer than its near-neighbour at 13km long. If you’re looking to get a glimpse of the awesome and terrifying forces that have carved this part of the country open over thousands of years, then you’ll want to take a heli-hike trip across the glacier’s face. If you’re forever telling yourself ‘I want to move to New Zealand’, to see the sights (and enjoy some of the other perks) then the easiest course of action is through a spouse visa. New Zealand is an amazing place to explore and enjoy the rest of your life.